Now that my young daughter has reached an age where she enjoys playing with colouring in books, I’ve also spent a fair bit of time recently helping her out. Being an adult who rarely gets to make a mess with felt-tips these days, I did assume that colouring in wouldn't actually be that much fun for me anymore. However, I’ve actually found it to be quite a therapeutic, pleasant and leisurely activity to get absorbed in on a lazy Sunday afternoon. Exactly the same thought process surfaced when I was tasked with reviewing THQ’s de Blob 2 - and strangely there's the same outcome. While de Blob 2 is essentially a colouring in game primarily aimed at kids, it does provide that same sense of satisfaction you get from bringing a colouring in book to life as you plod along peacefully transforming a miserable-looking, black-and-white landscape into a vivid technicolour world. 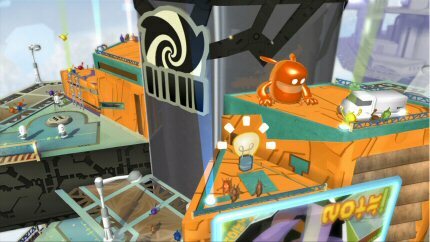 de Blob 2’s graphics aren’t outstanding by any means (compared to many PS3 games it does look dated,) but the visual style is instantly appealing, with bright colours that contrast vividly against the black-and-white backdrops, complemented by the merry soundtrack that tinkles away happily in the background, gathering in pace and intensity as you paint away. de Blob 2 is a very upbeat puzzle platform game and the effect of seeing these dull shades transform into vivid colours delivers quite a pleasant feast for your senses. The storyline is directly aimed at kids. While adults will just want to get on with the action, young ones may enjoy the cheery, well-produced CG cut-scenes that are full of charming characters. The tale features Papa Blanc and his religious cult of fanatics, who have sucked the life, soul and colour out of the city and its inhabitants. As de Blob, you join The Colour Underground, a resistance movement whose aim it is to inject life back into the city and take down the antagonist in the process. Though the main character is almost totally devoid of personality – he is just a blob after all - the storyline serves as a fairly solid excuse for some simple and occasionally challenging platform-based shenanigans. de Blob 2 is a unique concept and as such doesn’t feel like any other platform game I’ve played. The main bulk of the gameplay tasks you with bouncing around the levels absorbing different coloured paint from pools of colour, geysers and paint pots, and then using that colour to paint the town, rolling across and bouncing on a variety of structures and objects. The challenge comes from typical platform gameplay and having to work your way around the environment, colouring in sections while battling against the clock and the Inkies, who you can splat by stomping on their heads. As you progress you get access to a broader range of colours and can then start mixing them together to form new paints in order to solve some challenging objectives that often require a more strategic and formulaic approach as you seek to turn different areas of the city into specific colours.